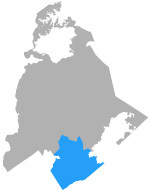 Sitting on the southernmost tip of Mecklenburg County, the South Division covers over 57.3 square miles. The southern part of Interstate 485 runs through the division, which contains neighborhoods such as Raeburn and Piper Glen. Also running through South Division is Providence Road, a major thoroughfare in Charlotte. CMPD’s South Division office is located one block south of Pineville-Matthews Road off of Johnston Road.